It’s Customer Service Week; a time to celebrate and thank representatives for their service and commitment to a challenging position in any company. The reps have a difficult job because they are frequently speaking with customers who are frustrated, concerned, angry, impatient or any combination thereof. The Customer Service Department, what The Center For Client Retention often refers to as the home of the company, does an amazing job answering questions, solving problems, making customers feel better and creating or maintaining customer loyalty. Customers prefer self-serve options. They will Google their question or see if any community forums have an answer first. The era of the simple question is gone. When a customer picks up the phone and calls, the issue is probably complex and the customer has already spent significant time searching for solutions. Many customers only call the Customer Service Department as the last resort. They are hoping the person on the other end of the line will not only solve their problem but will make them feel welcome and comfortable, listen and convey appreciation if they are a loyal consumer. Representatives understand their mission and they do it well. The typical representative may speak to nearly one hundred customers every day. They help more customers than any other department. And they hear the words “thank you” more times in a week than others in the company might hear in a year. Our research has shown that too often, when Customer Service Representatives hear, “thank you for your help,” their response is, “no problem”, “hmmm” or just no answer at all. It’s a missed opportunity. People tend to remember the last thing they hear more than the first. How a call is closed and completed is just as important as the initial hello. It’s imperative to tell customers that you want to hear from them again. Of course that doesn’t mean you want them to have another problem. But leaving the customer with the thought that you are there to help and support them builds loyalty. So, thank you to associates for your service. You are recognized for everything you do. Just as you are being thanked, remember to extend appreciation to customers as well. 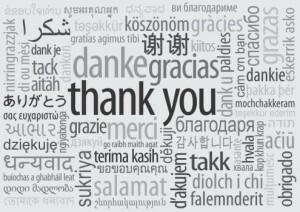 Every training manual must include how to properly thank a customer after they have said thank you to you. It’s a winning combination.